Target Inquiry “is an exciting, 2½-year, rigorous, and transformational professional development program designed to improve the frequency and quality of inquiry instruction in middle and high school science” (GVSU Target Inquiry). This program originated at Grand Valley State University (GVSU) while I attended undergrad there (2004-08) and continues today at both GVSU and Miami University in Ohio. While I did not participate in this program, several of our ChemEdX colleagues and guest authors have participated in the program including Sarah Kong, Doug Ragan, Ryan Schoenborn, Chad Husting and Deanna Cullen. The student will be able to classify unknown elements into a periodic table based on their properties. The student will be able to explain the periodicity of the trends of electronegativity, ionization energy, and atomic radii on the periodic table. The student will be able to predict properties of elements based on where that element is found on the periodic table. Students receive a deck of element cards with some properties of the main group elements. 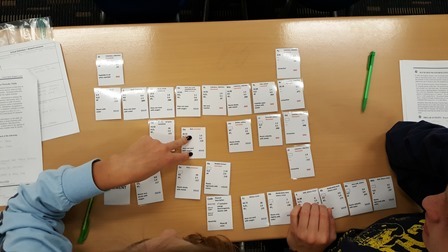 The cards are coded so students do not know the identity of each element. Students need to look for patterns in the properties of the elements to arrange them. Once arranged, students look for trends in the groups and periods of their periodic table. This is a great application of the vocabulary students learned in the first 2 days of the unit. This activity was written by ChemEd X editor, Deanna Cullen. I have had the pleasure of incorporating other Target Inquiry activities in the past including A Latin Pile, Change You Can Believe In, All Things Being Equal, and What’s In a Scientist’s Toolbox. I would encourage you to check out the Target Inquiry activities here. You’ll need to create a log-in but the access is otherwise free and is a fantastic resource. If you’d like to learn more about Target Inquiry check out their website. Deanna Cullen previously uploaded the Trendsetter Activity to ChemEd X. 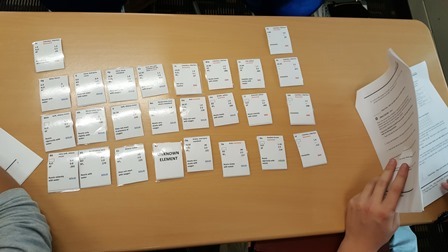 The teacher documents, including the cards used in the activity, can be downloaded from the Target Inquiry site. You will need to register for a free account and their staff will send you a password for access. Thanks for the shout out, Dan! When I wrote this activity, I taught about the periodic table early in the school year. Now that I use Modeling Instruction, we just recently used it since I have been following the suggested timeline of topics. I actually don't spend time discussing the trends or related terminology until after the card sort portion of the activity is complete aside from helping them understand what the ratios of X and O along with X and F mean. One thing that we end up doing that I had not included in the original lab is that when I pull out the magnesium and the calcium for the lab portion, we end up discussing the fact that when we talk about Ca, Mg, Na, Fe and other elements in our diet that they are not really the pure metal that we need for our bodies, but that those metals are part of a variety of compounds. I have bottles of iron and calcium supplements in my cupboard to show them examples. Seeing the Ca react with water brings the point home as well.